So far, a 5-m² pavement forming a distinct floor surface has been found in the cave. A burnt rock surface has been found at the edge of it, indicating that fire was burned there. Stone tools and the flakings left behind from the making of them have been found in the cave. The artifacts were made using different techniques. The oldest technique, called the Clacton technique, has been used on sandstone, quartz, and quartzite. The striking technique used on other objects is characteristic to the Mousterian culture. This was a classic technique used by Neanderthals to shape rocks. The cave thus has traces of human activity, which research has dated back 130,000-115,000 years. The Neanderthal is named after the small German village of Neanderthal where the first bones of this prehistoric human were found in 1856. For a long time it was thought that modern man was a direct descendant of the Neanderthal. Evidence has since shown that both types of human were living together for tens of thousands of years in southwest Asia and 5000 years in Europe. The Neanderthal is now thought to have been more a cousin of modern man than an ancestor. The oldest remains of a recognized form of Neanderthal are 115 000 – 130 000 years old. The last Neanderthals lived in France about 35 000 years ago. Neanderthal remains have been found only in Europe and the Near- and Middle East. Neanderthals were the first humans to adapt to living in a cold climate. The Neanderthal man looked different than the modern man. The Neanderthals were shorter (males averaged a height of 165 cm and females 156 cm), they were more muscular, and the shape of their skull was different. Their brain was somewhat larger than modern man’s. The shape of their face was characterized by prominent brow ridges, a large nose and a receding forehead. 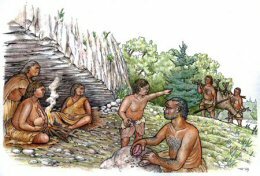 Very little is known about the culture and habits of the Neanderthals. It is thought that they may have cared for their injured, buried their dead, and communicated in some way. Survival in the harsh climate required a lot of nourishment, so they were also skillful hunters. Most of the findings in Europe have been in caves or shelters under rocks, but signs of dwellings built on flat ground have also been found in excavations. Tools used to work on leather have been found, suggesting that clothing made from leather was used to protect against the cold weather. Neanderthals disappeared from the earth about 30,000 years ago. The extinction of the species is one of the big mysteries of human evolution. What makes Wolf Cave so unique is its location in an area over which ice masses moved, wiping out virtually all signs of life before the last glaciation. It is remarkable that the ancient soil layers and signs of human life have been preserved in an area that has been covered with a continental glacier; the cave discovery brings completely new opportunities for research. At the moment, Wolf Cave is the oldest known dwelling site in the Nordic countries, but information learned through research can help to locate other sites.